10 August. 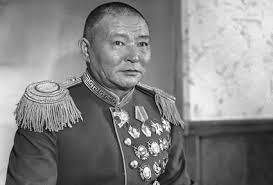 A day after its forces joined the Soviet attack on Manchuria, the Mongolian People’s Republic formally declares war on Japan and receives the first of many unification calls from Inner Mongolian leaders. Next day, the official organUnen Sonin, which only a month earlier had switched to Cyrillic, reverts to traditional Mongolian script to reach a wider audience. It reports that the war aims to unify all Mongols on the Mongolian plateau. This is the first of a five-part ** ‘Special Edition’ ** that presents all Mongolia and Manchuria materials in a single location. Click for Part II, Part III, Part IV, Part V The following expert analyses are related to the situation in Mongolia and Manchuria: Bruce A. Elleman, Sino-Soviet friendship and Outer Mongolia. Tsedendamba Batbayar, Mongolian independence and the United States. Uradyn E. Bulag, ‘Uninvited’ war and the Mongol trophy. Ravdan Bold, Mongolian participation in the war against Japan. Bruce A. Elleman, Soviet sea denial in Port Arthur and Dairen. Christian Hess, The fate of Japanese settlers in Manchuria. Li Narangoa, De Wang and the dream for a Mongolian State. Tsedendamba Batbayar, Mongolia’s national referendum for independence. Li Narangoa, Puyi: a survivor. Uradyn E. Bulag, The memorial park of the martyrs of Soviet-Mongolian allied forces.